delivery charge free in metropolitan France from 60€. Find out all our tips to take care of your face, your body and your hair our in our blog and in live chat,. Find the best products from Polynesia. This wide range of Tahiti oils and cosmetics guarantee optimum hydration and repair, for shiny and healthy hair, and supple and soft skin perfectly hydrated ! All the scents of Tahiti for an guaranteed olfactory journey ! Also find handmade products such as original colorful pareos or rolls of Pandanus for the making of delicate and traditional objects. you will find all our tips and beauty tips on our cosmetics enriched with Monoï de Tahiti! A melting and sweet texture ! With Monoï de Tahiti A.O., this mineral wax protective and ultra-bronzing is also a moisturizing and repairing balm that will give you an intense and lasting tan and a well hydrated skin ! With its creamy texture and restorative properties, it can also be used to nourish the body and hair. The Vanilla Milking Grease 5% is a very moisturizing balm with its composition of Monoi de Tahiti A.O. and ultra-tan, which will ensure you an intense and lasting tan. With its soft, melting texture and nourishing properties, it can also be used daily to repair the skin, or to detangle and smooth hair. The sweet vanilla favor will make you travel to exotic landscapes. Enriched with Tahiti Monoï AO , the Liquid Tiare Milking Grease Monoï is a moisturizing and ultra-tanning oil, which ensures you a intense and lasting tan. Through this deliciously perfumed care with Tiaré, find the ultra-tanning virtues of milking fat, associated with moisturizing and nourishing benefits of Monoï of Tahiti A.O..
Used in the daily care to nourish the skin, or to smooth and shine the hair, it acts like care sheathing and detangling. A perfect Tahitian tanning ! With its innovative combination of sunscreens and natural nacres, this milk offers optimal and long-lasting protection against sunburn and skin aging, while nourishing and beautifying your skin. With its balanced formula of natural sunscreens and mother-of-pearl High Protection Milk SPF 30 offers optimal moisturizing UV protection while helping to preserve photo-aging. Inspired by traditional Polynesian healing, its formula is enriched with natural sources of antioxidants. Used in daily body care, Frangipani Monoï Oil softens and protects your skin. You will also appreciate it as a relaxing massage oil, bath oil, or all summer as tanning oil without protection. Used in repairing and nourishing hair care, this oil reveals the shine and shine of dry, damaged or curly hair. Used in body care, it softens and protects all skin types. You also like relaxing massage oil, bath oil, or all summer as tanning oil without protection. Coconut Monoï Oil is used in hair care, repair and protection, it makes the shine and shine dry and damaged hair. Used in body care, Vanilla Monoï Oil softens and protects all skin types. You can also enjoy relaxing as massage oil, bath oil, or all summer as a tanning oil with no protection. Used in hair care remedial and protective, she reveals the brilliance and shine of dry, damaged hair. Rich in Monoï de Tahiti and Tamanu oil this after-sun milk contains a last-generation ingredient which prolongs the tanning. It is an ideal treatment with the benefits of Tiare, the moisturizing properties of Coconut oil, and the exceptional virtues of Tamanu. The most popular alcohol in Polynesia ! Hinano is a beer brand produced in Tahiti by the Tahiti brewery. It is by far the most popular brand in French Polynesia . Hinano beer is a luxury blond beer, golden color and a thin layer of white foam . Basic fermentation, it is drawn to 5% alcohol. It reveals a strong bitterness pronounced at the end of the mouth. Tahiti Drink, the Punch of our islands par excellence! Tahiti Drink is the alliance of our delicious Pineapple Queen Tahitian juice accompanied by a touch of fruit of Passion Juice, a zest of Orange, the delicacy of the Vanilla and the finesse of our alcohol distilled at the factory of juice of Fruits de Moorea. This Rotui alcoholic cocktail, original taste of Polynesian hospitality, is ideal to give a festive touch to all the occasions to meet up with friends. Tahitian Black Gold at your fingertips ! Discover our selection Grands Crus de Vanilla de Tahiti! The most coveted variety in the world .. The Vanilla Tahitensis its scientific name, is a very nice vanilla, and very fleshy. The pod, of brown color is very thick, very fat, which gives it a much more fruity and perfumed taste than its cousin Bourbon. Tahitian Vanilla has a very original taste as spicy, sweet with hints of gingerbread and candy.Prepared under the sun of Vanilla Island: TAHA'A. Its scent perfumes the valleys of the island early in the morning. A concentrate of energy and originality ! Obtained from double maceration of Pineapple fruit, Tiare Tahiti flowers, Coconut oil, we intensify for you all the magic of massages. Monoï de Tahiti Pineapple Gourmand results from the combination of these plants, which gives it all their benefits and its fragrance is intensified by the addition of the Pineapple Fragrance. Moisturizing and nourishing, it leaves the skin soft and cleanses deeply. Apply on the body and on the hair, its sweet perfume will transport you. A real olfactory experience that will instantly awaken your senses. 100% relaxation and relaxation ! A perfect care oil for your massages, your baths, your beauty treatments. The Monoi de Tahiti Gourmet Kiwi results of the Coconut Oil and Tiare flower Tahiti, added from a second maceration of greedy fruits: The kiwi. Kiwi is a fruit native to southeastern China. This fruit is above all an incomparable source of vitamin C, but is also provided with vitamins A and E, the benefit therefore of an excellent vitamin intake for the skin and the hair. Nourished, moisturized, and protected from external aggressions, let your skin and your hair soft and silky ! For delicious and captivating massages! 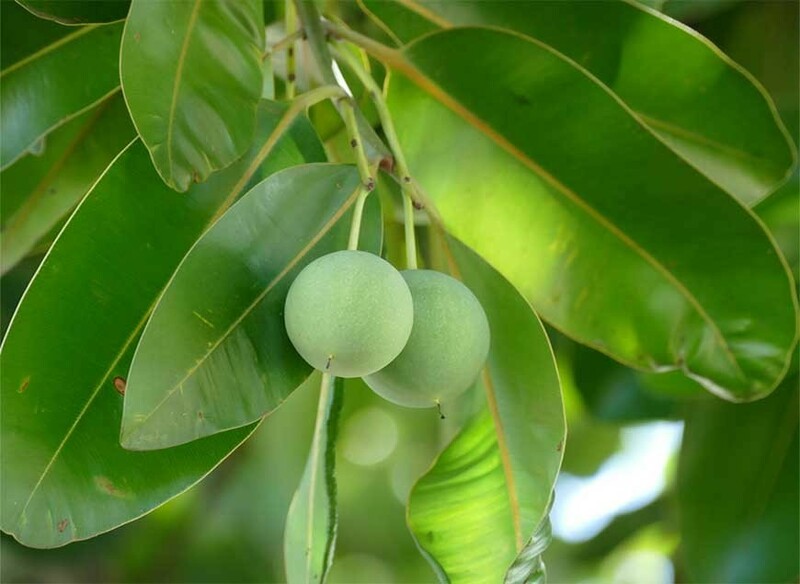 In Polynesia, the Mango Vi Popa'a, is widely used for its many therapeutic properties. Generously stocked with provitamins A and vitamins E, B, and C, mango has exceptional nutritional value for healthy skin. This Tahiti Monoi AO . of a flower maceration of Tiaré in the coconut oil with Mango gourmet scent is a true olfactory exerience, deliciously exotic! Monoï de Tahiti A.O. Gourmet Mango is designed for beneficial and stimulating massages with heavenly scents. It can be used especially for moisturizing skin and healthy hair! A perfect selection of Tahitian products based on Monoï de Tahiti for the body and hair : Before, during and after exposure to the sun for soft skin, nourished, golden and sublimated hair to be able to shine throughout the year! Escape and get drunk with exoticism ! Hawaii, papaya is grown on a large scale to extract papain, which is used in slimming food supplements and other nutraceuticals. The papaya, riched in antioxidants and vitamin C, represents a real opportunity to restore tone and vitality to your skin. The Monoï de Tahiti A.O Gourmet Papaya results from the combination of these plants (double maceration), which gives it all their benefits. Adapted to tropical temperatures thanks to its lightness, this pareo with very soft fabrics, will seduce you thanks to its printed motif illustrating a Polynesian rower in pirogue. Polynesia within reach of your creations ! Braiding is originally a specialty of the Austral Islands, but today there are woven articles throughout Polynesia. The vegetable raw material is mainly used is the Pandanus, but the coconut leaf (niau) or the local bamboo (ofe) are also braided. Articles made are traditionally hats , baskets or mats (peue). With the development of handicrafts and tourism, Polynesian weaving has evolved into a greater diversity of articles . We now find purses, cigarette cases, fans, bracelets, sandals, earrings, etc. Nevertheless, carpets (baskets), baskets and hats still constitute the bulk of production. The Vahine Box for well-kept secrets ! Discover the unique know-how of Polynesia. The art of traditional marquetry, in the pure Polynesian tradition ! It is made and manufactured with tropical wood species and rosewood. A perfect object of storage (jewelery, letters, souvenirs ...), decoration, and gift, to bring a touch Polynesian in your daily life and life style ! To look like a pretty Vahine ! Very beautifull Hair clips for your hair, with a really large choice of colours. For a smooth and sensual look like the beauty of the Vahine. Carried for centuries by the Maohi people, the sarong of the islands, formerly called paréu, went around the world like the ideal beach suit, under all suns. Local craftsmanship claims more than ever its Polynesian origin. Note: The sarongs are "handmade", the colors can be more nuanced from one sarong to another. There are very small thin hair clips, simple, almost invisible, to tame a rebellious wick, fix a very tight bun and a banana plated ! Opt instead for a more natural, more flexible, and more bohemian hairstyle, with our pretty yellow and white hair clip and their pretty pearls in the heart of the jewel. The image of grace and femininity. Find the latest news and all our expert beauty tips for a glowing skin in our blog. Nourishing, moisturizing, protective and restorative, Virgin Coconut Oil is a vegetable oil multiple properties. Find our Tahitian Secrets team on Booth 097, on this new 2018 edition of "La foire de Paris" ! Find our Tahitian Secrets team on Booth G-31, on this new 2018 edition of Nauticales Boat Show in La Ciotat ! Tahitian Secrets will be present at the Salon International de l'Agriculture 2018from February 25th to March 5th !